Hi everyone! Hope you are all enjoying the summer so far (if it is summer where you are!) Our summers are short and sweet here in the beautiful Adirondack Mountains of New York, so I have been enjoying it while it lasts! In today's post, I would like to share with you one of my favorite summertime treats, a watermelon basket. It is the perfect thing to bring to a party, BBQ, or potluck. It is naturally raw, and vegan! 1.) 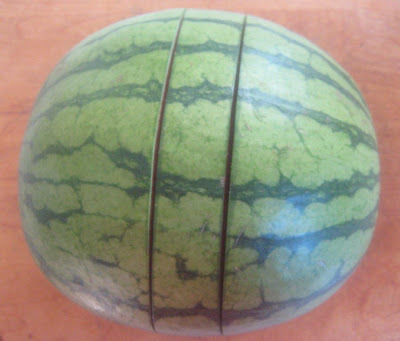 Pick a melon that has a nice shape, and will sit flat. You can remove a sliver off the bottom to level it if needed. 2.) 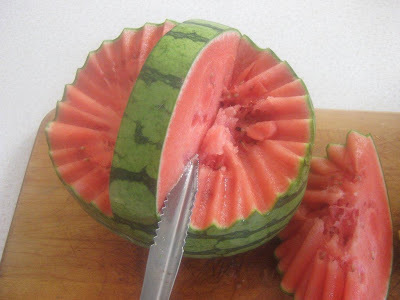 Make two parallel cuts in the center of the melon about 1 1/2 inches apart, going about halfway down the melon. 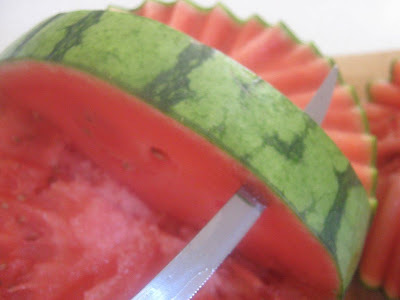 The melon between the cuts will form the handle of the basket. 3.) 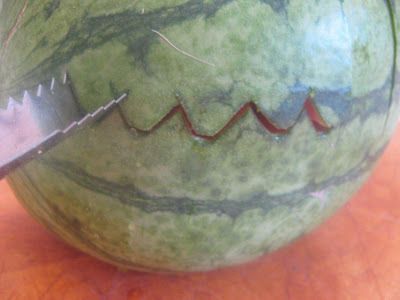 Starting on either side of the handle, make a horizontal cut around the melon to the other side of the handle cut. 4.) Repeat the cut on the other side of the handle, removing both cut-outs. 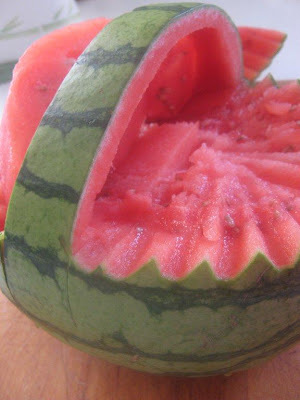 and remove the juicy melon. 6.) 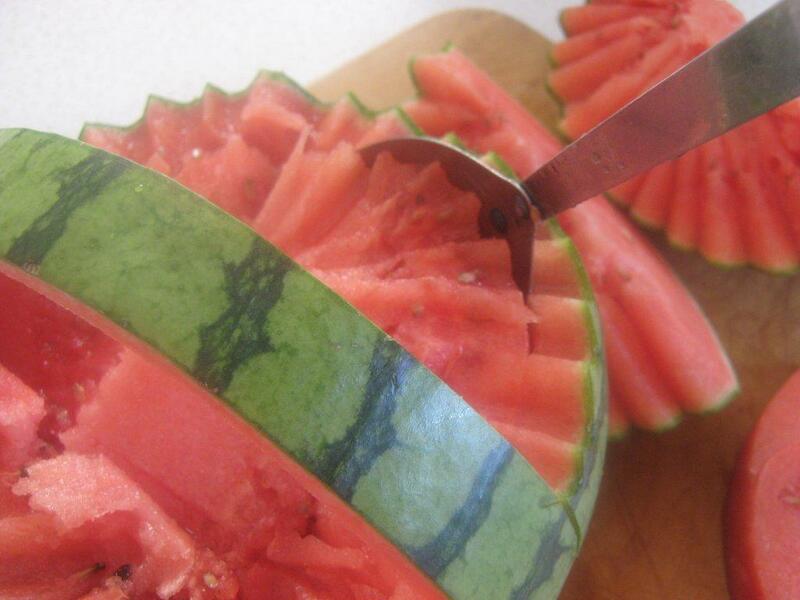 Scoop out the melon. I used a large serving spoon. My mini melon was thin skinned, so I left a little flesh to keep it sturdy. 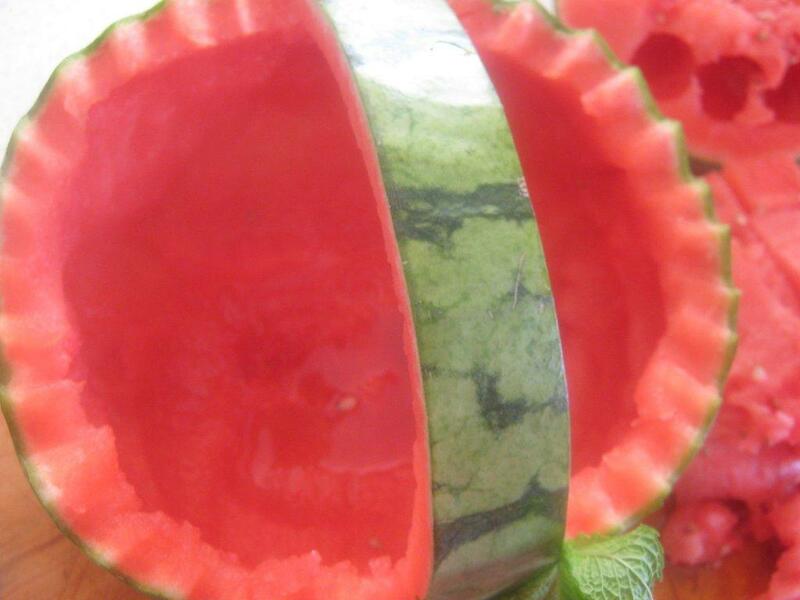 Larger melons can be scraped closer to the green part. 7.) Cut up the removed watermelon and mix it with your favorite fruits. 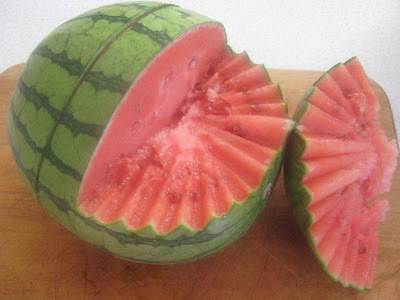 If you follow food combining rules, just use other melons, like cantaloupe or honeydew. 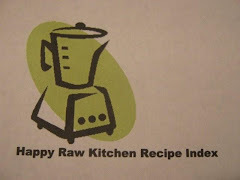 Thanks so much for stopping by my happy raw kitchen today, and I hope you all have a very happy and safe weekend! Really cute. I suppose I've seen similar things before, but I really like your presentation, and I've never seen a photographic demo like this. Thanks! Brilliant work on the Watermelon ♥ You are such an artist! 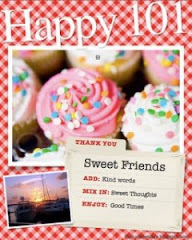 Wish you a great 4th of July...I was one time (long ago) in WDC on a 4th of july..It' s an awesome celelebration!! that's sooooooo awesome!! And so easy! Thanks for the tutorial! I am looooving watermelon! YUM! Have fun! Beautiful. I love the step-by-step posts. I always learn something new from you. p.s. I did make your sprouted bagels and will be posting all about it soon. They were a huge hit. 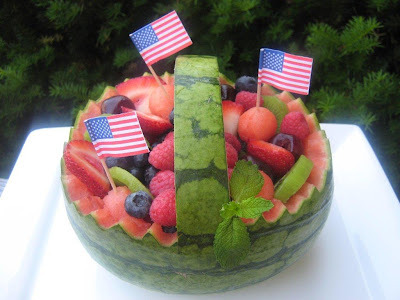 have a beautiful 4th of july long weekend! Wow, how beautiful! Great idea! Snazy! Nice. I want to try that some day. gorgeous! 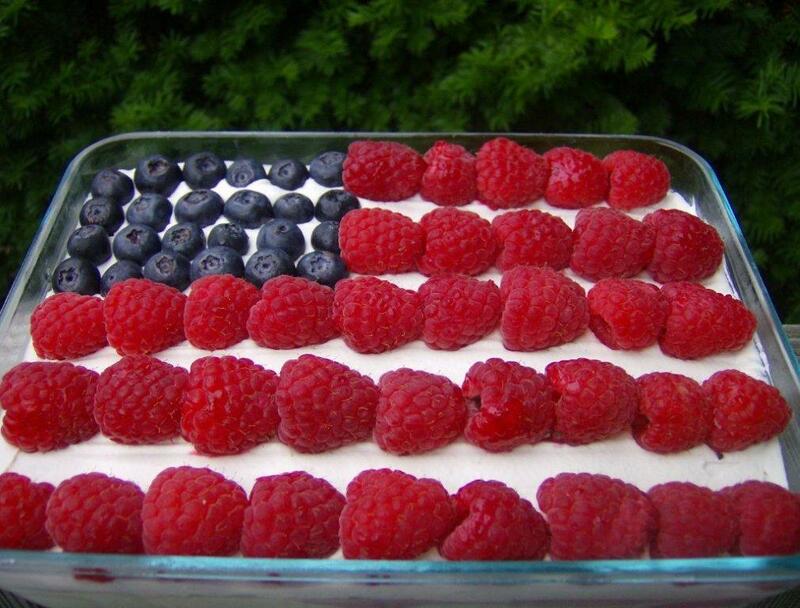 i'd be delighted to see something like this at a 4th of july party. you are an artist! Wow! What a wonderful idea, and the step-by-step is very useful. Thanks!! All of these ideas are fabulous, Angela!!! 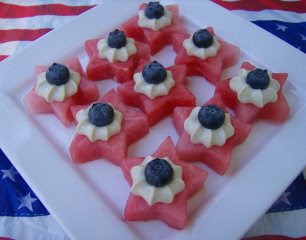 I really wanted to do the raw flag cake but ran out of time... the hub had to work yesterday :( Boo! I think I might still do it. Thanks for the inspiration. Have a great week. 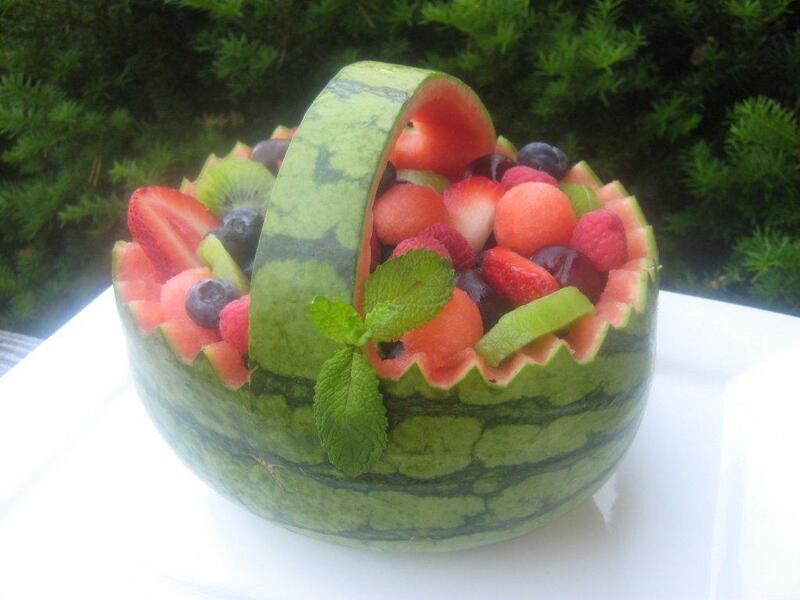 I love the watermelon basket, what a great idea! 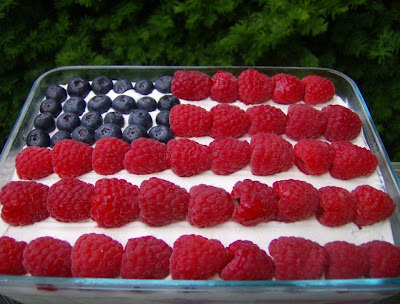 Now I'm going back to check out the flag cake! I made one! No jagged edges, just flat. It was fun to do! Posted a pic on my latest post. Love it! I've seen these before but never tempted - you make it look so easy that I could even do it. ;) I saw the on bitt made for her sister's baby shower and it looked awesome too! Love the how-to's. So great! 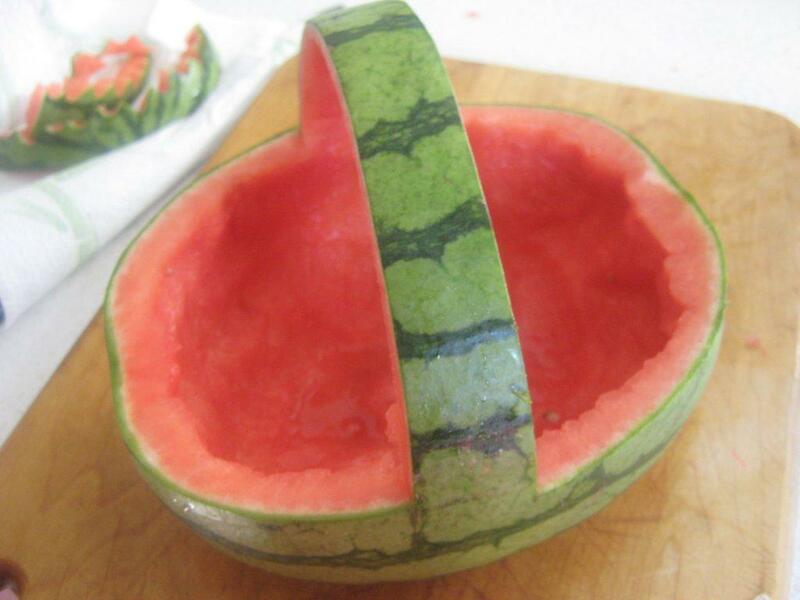 You make the watermelon basket look so easy even someone like me could do it. Thank you for the simple, easy instructions, the best I've ever seen. 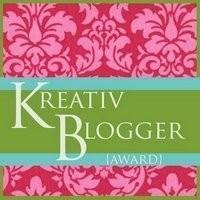 Ani's Raw Food Essentials Book Giveaway! Welcome, everyone! My name is Angela, and in February 2007, I discovered the benefits of raw food. Since then, I have enjoyed the challenge of creating healthy, delicious meals using fresh vegan ingredients. Thank you for joining me here!